Bishop Mark O'Connell has always felt fortunate that God called him to the priesthood. "An altar server once asked me 'If you had another life to live, and you could be anything -- anything at all -- what would you be?,'" he recounted, smiling. "I answered him, 'I would be a priest. That's what I would be. I am a priest, that is who I am, this is who God created'. I don't have any other identity," shrugged Bishop O'Connell, adding with a laugh, "That altar server was very confused." "I've always been a happy priest -- I'm really lucky that way," Bishop O'Connell said. Bishop Mark O'Connell was born June 25, 1964 in Toronto, Canada to American parents. The youngest of four children, he spent the first 12 years of his life in Toronto while his father, Thomas O'Connell worked as the university librarian at York University in Toronto. "His job there was to build a library completely from scratch," Bishop O'Connell said. "There's a story that my father went into a small little bookstore in Toronto and quite literally bought every single book to begin what is now the Scott Library at York University." While living in Toronto, the O'Connell family attended St. Gabriel Parish, run by the Passionist Fathers. It was at the parish school that Bishop O'Connell was first drawn to the priesthood. "I remember a newly ordained Passionist Father coming into my first grade class to visit us. Even then I knew how special that was," he recalled. In 1976, his father was offered the position of university librarian at his alma mater -- Boston College, where he helped establish the O'Neill Library, and later the John J. Burns Library, the special collections library at Boston College. The family returned to their native Massachusetts and settled in Dover, where Bishop O'Connell attended the Dover-Sherborn public schools. "I always tell people that my home is Dover, with a Toronto twist," he smiled. After graduating high school, Bishop O'Connell attended Boston College. "It was then, on my 18th birthday, as I had just graduated high school and had no idea what my major should be, that I really thought about the priesthood," Bishop O'Connell recalled. "So it was my birthday, and I'm sitting on my back porch -- and I know this is an incredibly boring vocational call -- but I'm sitting there with this thought, 'I don't know what I'm going to do with my life. Don't know what major I'm going to pick. I wish God would call me to be a priest.'" "Thankfully I had a further thought that maybe that first thought was the call, so I decided to live my life, starting that day, preparing for this and that anytime I wanted to stop, I'd stop," he said. "I never stopped," he added with a smile. For one year, Bishop O'Connell told no one of his intention of entering the priesthood. When he finally told his parents, his father advised him to take a year to ascertain his call. "That was a great gift my dad gave me," Bishop O'Connell said. "It was like, 'You don't have to make that decision now, but if you still want to after a year, then you can be certain that's God calling you.'" "One year later, I was still feeling God's call, so I went straight across the street from Boston College to St. John Seminary," he said. 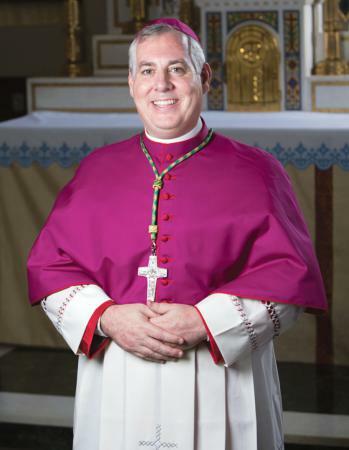 "The thing about my vocation is that it's not a surprising thing," Bishop O'Connell mused. "It's in my blood. It's part of my DNA." He noted that his family has several vocations -- his maternal uncle was Father David F. Delaney, a Boston priest; his maternal aunt, Jean Delaney is a Dominican Sister. Two great-uncles were also priests -- one in the Springfield Diocese and the other in the Boston Archdiocese. "I guess vocations run in my family," he said. After completing his studies at St. John Seminary, in 1990, at the age of 25, Bishop O'Connell was ordained to the priesthood. "That ordination was famous for its protest," he explained. "A gay activist group called 'Act Up' that was very prominent at the time, protested outside the cathedral as we were being ordained. Throughout the whole ordination, you could hear them through the walls." Ordained the same year was Bishop O'Connell's close friend, Father Paul Soper. "We actually became friends even before entering the seminary, at a discernment weekend we both attended," Bishop O'Connell said. "Over the years I have had lots of friends, but Paul is special." As a newly ordained priest, Bishop O'Connell was assigned to St. Barbara Parish in Woburn, where he remained for five years. "That was a very nice parish to be assigned to. It was a very special place, with a beautiful community,'' he said. "I go back, and there are still a lot of the same people 20-plus years later." In 1995, Bishop O'Connell was given a double assignment: parochial vicar at St. Mary of the Annunciation Parish in Danvers and campus minister at Salem State University. "Campus ministry is fascinating," he said. "In the parish is where my heart is, but nevertheless, I was very happy to be in campus ministry." Two years into that assignment, at the annual Chrism Mass, Bishop O'Connell was approached by then-Vicar General Bishop William Murphy. "He said to me, 'Mark, I need to talk to you. Come to my office,'" he said. At that meeting, the Vicar General asked Bishop O'Connell to go to Rome to study Canon law. "Never once did further studies enter my head. It didn't enter. Not once," he said shaking his head. "I was more shocked that day than when the nuncio called to make me a bishop." That summer, Bishop O'Connell devoted himself to studying Italian before beginning his studies at the Pontificia Universita della Santa Croce (the Pontifical University of the Holy Cross), an Opus Dei seminary in Rome. "I was not that great in Italian," he admitted. "In that first lecture, I understood nothing!" He did tough it out, and by the time he completed his studies in 2001, he was able to defend his doctoral dissertation in Italian. In July 2001, Bishop O'Connell returned to the Archdiocese of Boston and began working as the assistant to the Moderator of the Curia in the Canonical Affairs Office. Less than two months into his job the world changed because of the Sept. 11 terrorist attacks. Four months later, the clergy abuse scandal erupted. "If you want to know about my life, you have to know something critical -- I studied Canon Law in Rome for normal Church time," he said. "The world I studied for was very different than the world I have practiced in. Very, very different." Together with three other canon lawyers, Bishop O'Connell sought to navigate the unchartered territory the Church found itself in. "For the past 14 or 15 years, one of my primary jobs has been to try to be the solution rather than the problem. And to try to figure out canonically how to treat priests and accusers justly. Never once in my studies in Canon Law did I come across something like this, this was a whole new territory, with all new precedents." Then, after Cardinal Sean P. O'Malley arrived in the Archdiocese of Boston and began tackling more of the archdiocese's difficulties, there were additional issues to address. "Cardinal Sean had mammoth problems on his hands," described the bishop. "He had the abuse crisis, he had a financial problem with the clergy funds, and with a huge deferred maintenance problem -- which was a lot of money. He had a priest shortage, and a lot of priests leaving the ministry." As a canon lawyer, Bishop O'Connell helped the cardinal navigate the problems, and was able to assist in the solutions. "At one point I was doing the abuse crisis, closing parishes, and the tsunami in the clergy funds. All of which I was not prepared for; all of which I did my best," he said. In 2007, Bishop O'Connell was appointed Judicial Vicar to the Metropolitan Tribunal. According to its website, "the Metropolitan Tribunal of Boston is charged with the administration of justice, as a court of first instance and as an appellate court, for matters of the public good brought before the Church. Although most cases brought before the Tribunal involve questions of marital nullity, the court also acts as the competent forum for other issues, including penal matters." "I didn't have any experience in marriage cases when I went to the Tribunal," Bishop O'Connell admitted, noting that he quickly realized the annulment process in Boston was different than that of Rome. For the past nine years, he has changed the way annulments are processed in Boston, he said, making it "as efficient as it has always been, but more Roman in its approach." "If you want to get appeals to go to Rome, you have to make your system more Roman," he explained. In addition to his work at the Tribunal, Bishop O'Connell also began teaching canon law classes both at St. John Seminary and at Pope St. John XXIII National Seminary. "I really like to teach," he said. "I find that very life-giving. I hope that I can continue to do that as a bishop." Bishop O'Connell noted he is looking forward to serving the Church as a bishop. "It's funny," he mused, "I was saying this a couple of months ago: I could see the light at the end of this tunnel because the abuse cases are done, the new annulment process is done." "I wasn't sure what I was going to do with my life. But God has now shown me what I'm going to do with my life," he laughed. He explained that his motto, "Invenimus Messium" ("We have found the Messiah"), which are the words uttered by St. Andrew to his brother St. Peter when he finds Jesus, underscores his desire to follow in St. Andrew's footsteps to "bring people to meet with my Messiah." He is looking forward to celebrating the sacrament of confirmation, noting that "the gifts of the Holy Spirit have guided me throughout my life." "I want, in some way, to make confirmation a memorable occasion," he said. "I don't know what else will come, but I am ready," he smiled. "I've always been a happy priest; I plan on being a happy bishop."